Teachers have a bloody tough job. I don't envy them, and I think most people in the community celebrate and even venerate the work they do. Being a teacher has, however, become far more difficult in recent years. Part of the reason is the incredible sensitivity to allegations of child abuse, meaning that teachers have all sorts of restrictions on what is appropriate in their interactions with children to shield them from accusation. One of the biggest burdens that teachers bear is the fact that they are "mandatory reporters" - if a teacher has reason to believe that a child is being abused or neglected then they are required to report it. I have no doubt that this obligation rests heavily on the shoulders of teachers. In order to make sense of any of this, it is important to get our head around the details. To do this, it's essential to carefully read the judge's reasons for the decision. They are available online here. Having read the media's commentary on the decision today, it is worth speculating how many of the reporters actually took the 10 minutes it took me to track down the decision and read it. It's also interesting to wonder why it is NOW that the story has broken. The judgment has been available for 4 months - I assume that either the jury came back with their verdict this week, or perhaps someone issued a press release - perhaps the NSW Teacher's Federation who was quoted in the Daily Telegraph article. The 14 year old was accused of Armed Robbery in Company. Sometime after being charged, he started at a new school. The issue at trial was whether this evidence was admissable to prove (in part) that the boy had committed he offence. The judge ruled that the evidence was not admissable. In due course, the trial proceeded and the boy was found not guilty. Not having access to the full transcript of the trial we can have no real idea as to why, but of course even the lawyers who sat through the trial can only guess the reasons that the jury had to finding him not guilty. The ONLY issue that the judge looked at in the above decision was whether the evidence was admissible; that is to say, whether the jury should be able to consider it. Questions of admissability are considered in just about every contested legal hearing. Evidence is excluded for all sorted of reasons - it might be because it was irrelevant, because it was hearsay, because it was illegally obtained, or because it was prejudicial. There are all manner of tests that have been established in the law as to whether evidence is admissable. The discretion this gives the court is broad. An obvious example would be where the admission is extracted through torture, or where a person was offered some sort of reward for confessing. In those cases, it would be unfair to allow the admission into evidence because, plainly, it would be an unreliable admission. This case was different. Was it unfair to allow a court to rely on this admission? For those reasons, the court found that it was unfair to allow the Crown to rely upon the evidence, and excluded the evidence. It is a difficult decision - the fact that there is no precedent is perhaps not surprising given that the unusual circumstances. I do not imagine that this scenario is one that any teacher would expect, let alone have received training for. The important issue I want to clear up initially is this: no one here is criticising the teacher. The teacher is not "in trouble" - he/she is not been counselled and has not been stood down. No one is suing him/her/the department, and no one is suggesting that he/she has done the wrong thing. 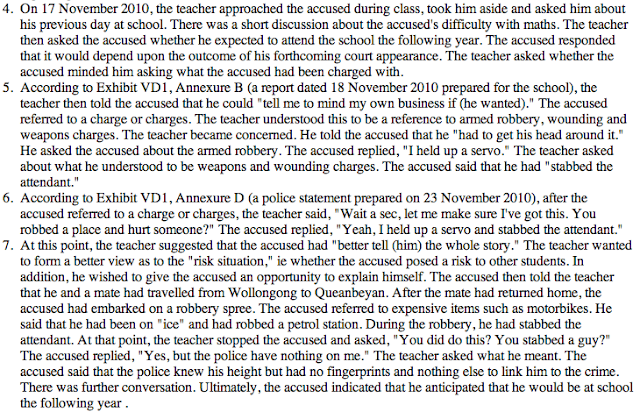 The ONLY issue is whether the teacher's statement detailing the conversation is admissable evidence against the boy. That point appears to have been lost in the discussions I've followed today. No one is suggesting that teachers now have to warn every child before they speak to them - the court is merely saying that if the Crown wants to rely on these admissions, then it is appropriate that before discussing such issues with a child then a teacher should follow what this teacher said was his/her usual practice of "cautioning students in relation to the disclosure of criminal offences." That's it. If a teacher doesn't want to ensure that he/she can report any disclosures to police, then he/she can chat to a student in whatever fashion he/she likes. It is only if the teacher plans on reporting any admissions to police that he/she needs to warn the student. Now, as I have said, I'm not myself certain that the decision was correct. 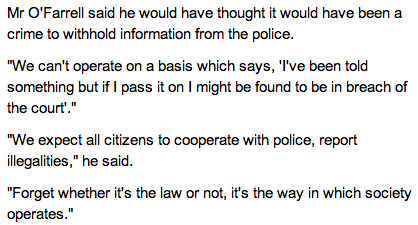 Given the outcry today, the DPP may well appeal the decision to clarify the law. It is curious that the DPP did not appeal the decision before the conclusion of the trial so that the decision could have been (potentially) overturned before this boy was acquitted. Now that the jury has reached a decision, the ship has sailed on this prosecution. Greg Smith's reaction, as quoted in the Herald was fair and measured. His reaction also betrays a misunderstanding of the decision. Nothing stopped the teacher reporting anything, and no one is criticising him/her for what was done. The only issue is whether the evidence is admissable. O'Farrell's comment reveals the danger of making comments about legal decisions when you don't actually understand the issue being discussed. It is exactly these kinds of statements that fan the flames of community outrage. The comments are based upon an incorrect understanding of what has actually happened. O'Farrell has either not read the decision or doesn't care, because it is politically convenient to make an argument based on "common sense". 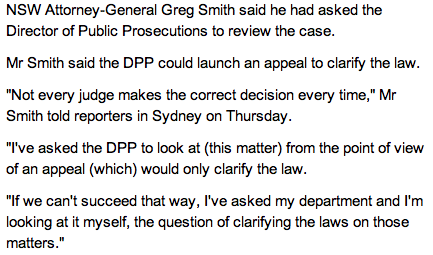 Greg Smith has done exactly what an Attorney General should do - respectfully suggested that he disagreed with the decision, set out an appropriate path to dispute the decision and left it there. In preparing this BlogPost I did what I normally refuse to do, and subjected myself to some comments on the Daily Telegraph article. Suffice to say that almost without exception the comments were a cascade of the most aggressive and unpleasant criticism of the judge, the court system and lawyers generally. Climbing on board that bandwagon is easy politics for O'Farrell - it is simple to agree with an angry, poorly informed mob. Greg Smith has done the right thing and respectfully disagreed with the judge. It's a shame that our Premier could not take the same approach. *DISCLAIMER* I am the same "Coldsnacks" mentioned in the Barry O'Farrell tweet. I am also currently undertaking a Masters of Teaching (Secondary) where I have completed compulsory Child Protection workshops, dealing with mandatory reporting. All views expressed within this comment are my own and do not reflect the views of the university, the Department of Education and Communities or any other professional or official body. Para 31: The judge states that it was "unfortunate" the teacher did not follow his usual method of cautioning a student that what is said is not considered "in confidence" and may be passed on to a higher authority when he believed the student may tell him something incriminating. However, that ignores the fact that the teacher did not believe that the question "Are you planning on coming back next year" would lead to an admission of committing a crime. I don't think the judge applied a "reasonableness" test there. - Secondly, the judge highlights (correctly) that as a teacher AND a year advisor, the teacher in question is responsible for the welfare of the student. I asked a lecturer of mine (someone with many years of experience in teaching high school students) whether a student committing a crime was a welfare issue. The answer was "Yes". Surely, reporting that a student committed a crime is still looking out for that student's welfare, no? Or, from another angle, given that this was the year advisor, this means he was responsible for the welfare of the cohort as a whole. When a student has just told you he took ice and stabbed someone, the argument could easily be made that reporting it is protecting the welfare of that student's classmates. Thirdly, this does send a mixed message to teacher's about reporting (BOF is right on that part). Why is it that if a student comes to me and tells me, of their own volition, that they were beaten by their parent the night before, or that they took illegal drugs, I'm LEGALLY required to report it* - but on the precedent now set by this case, if a student comes to me and admits to committing a crime, I would be in the wrong to report it, despite any welfare concerns that may be evident? Where does the duty of care start and end? * Or if another student comes to me and tells me that they know Student B is being abused, or taking drugs, or any other student welfare concern. To put it bluntly, if a classroom teacher even suspects - no proof required - that there is a welfare issue, we are obligated to report it. If we don't, and it a) turns out there is an issue; and b) it's discovered we had suspected that there was but took no action, again, legal consequences under Mandatory Reporting legislation. Better safe than sorry. Of course, tact is a requirement as well - in this case, note how the court documents show that the teacher gave the student the chance to not say anything? Anyway, that's my rant on this case for the moment. Will be interesting to see what, if anything, occurs from here on out. "Why is it that if a student comes to me and tells me, of their own volition, that they were beaten by their parent the night before, or that they took illegal drugs, I'm LEGALLY required to report it* - but on the precedent now set by this case, if a student comes to me and admits to committing a crime, I would be in the wrong to report it, despite any welfare concerns that may be evident?" The decision did NOT say you would be in the wrong to report it. All it said is that if you did report it, police would not be able to rely upon said statement to prosecute the child. 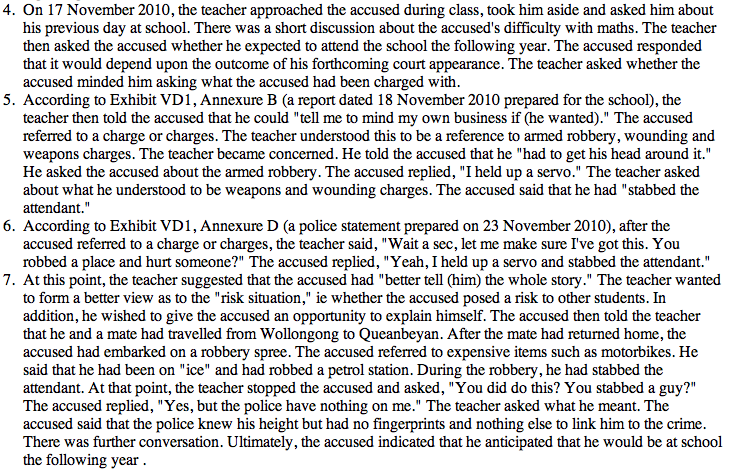 The decision makes no comment on the fact it was reported and did not criticise the teacher for doing so.